Eden Hazard is set to sign a new contract with Chelsea and could go on to become one of the club's greatest players, says manager Jose Mourinho. Hazard will reportedly sign a five-year contract worth around £200,000-a-week. "He will [sign]," said Mourinho. "My club always told me that the situation would finish with a new contract, so I was never worried about that." 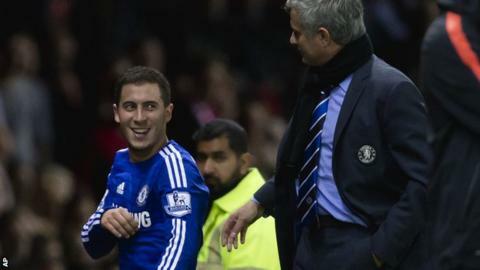 Mourinho also said the Belgian, 23, has the potential to become a club legend, but warned: "He needs to win titles." Hazard, who joined the Blues from Lille in 2012, won the Europa League with Chelsea in 2013 and was voted PFA Young Player of the Year last term. Mourinho said: "I don't know players who are considered legends in clubs without winning titles, so he has to do that but the potential, I think, everybody knows." Hazard is currently operating without an agent but Mourinho was never concerned that the winger would not extend his stay at Stamford Bridge. "I was never worried about it, since the moment I met his father," Mourinho said. "Everything was very clear about their intentions and their happiness to stay with Chelsea." Hazard has scored four goals in his last seven matches for the Premier League leaders.